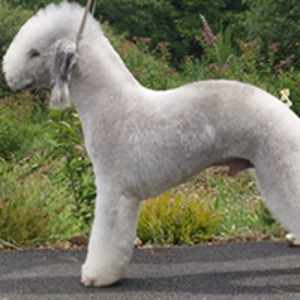 The Bedlington Terrier has the heart of a lion, the attitude of a terrier and looks like a lamb! Don't be deceived by this Terrier. They have a fragile lamb-like appearance - BUT underneath those cute little curls is a hardy little dog which has feistiness and affection in equal measures! 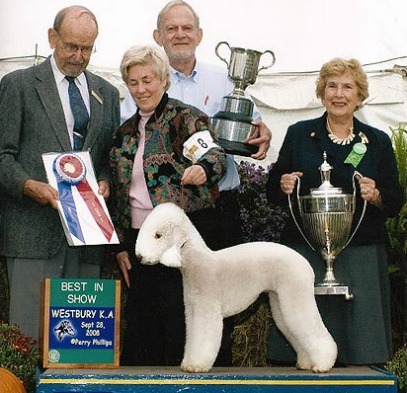 The Bedlington Terrier enjoys being part of a household and absolutely adores being the centre of attention. Although loyal and loving to all, he tends to choose one member of the family to bond closest with and may well spend all his time following them around like Mary's little lamb in the nursery rhyme! Bedlingtons are a bit calmer than most of the other terrier breeds which makes it a bit more enjoyable to have them indoors with you although they can become fearless in an instant when needed to stand up to a more dominant dog or to chase after foxes and other vermin. Other dogs and pets can be an issue for this terrier unless he has been socialised with them from an early age after which he will learn to accept them. However, he insists on being the top dog (alpha) so expect trouble if he meets a more dominant dog than him! 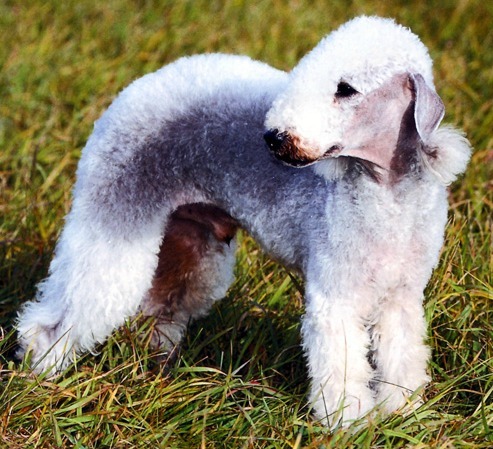 Despite this, the Bedlington Terrier is an affectionate little chap who will reward you with loyalty and a deep desire to please you. The Bedlington originally hails from the North-East of England in a town called Rothbury on the Scottish/English borders of Northumberland. In fact, the breed is still sometimes known as the Rothbury Terrier. During the late eighteenth and early nineteenth century, the breed was still mostly known as the Rothbury terrier and its appearance differed slightly from the one we've come to known today in that the legs were a little shorter. These terriers were originally bred to catch a wide range of vermin such as mice, rats, badgers, rabbits, hares and foxes. The fur on the bottom part of their legs was thicker and longer to protect them from bites from the vermin whilst fighting. They were even used by miners in Northumberland to clear the tunnels of rats as they were adept at going underground. There is also evidence of them being used as fighting dogs as they are extremely dominant. Bedlingtons were crossed with whippets in the 1870s to help to produce the longer legged, speedy version we recognise nowadays. This speed and great trapping ability made them a popular choice for poachers which in turn earned the Bedlington the nickname of "Gypsy Dog". The Dandie Dinmont Terrier also played a part in this unusual dog's heritage. Nowadays they are mostly used as companion pets rather than ratters. 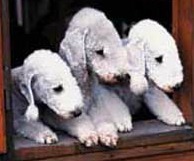 Bedlington Terriers are fairly easy to train. They learn new commands pretty quickly once they've figured out what you want from them and are sensitive to the tone of voice used in training. Bedlingtons are very active and need a fair amount of exercise to help burn off their energy.Two sixty minute walks a day will help to stretch his legs a little. They should be socialised from an early age to cut on their aggressiveness towards other dogs especially more dominant ones. 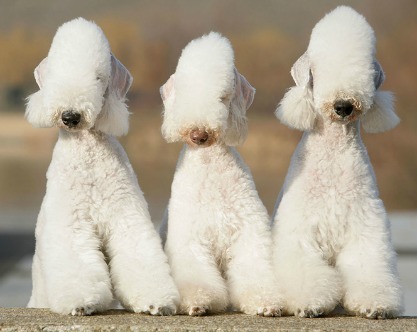 Bedlingtons will make it known to everyone within earshot when there's a stranger or intruder around! But once inside and it's been made known to him that the stranger has been accepted by the Master of the house, this terrier will welcome the newcomer with open paws. This is one high maintenance doggy! The Bedlington needs his coat brushed daily as the tight curls can quickly become matted and impossible to get a brush through if left for too long. Clipping every 6 weeks is required and he should be bathed only occasionally as this can cause the waves to disappear. 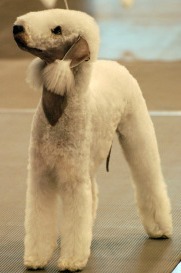 Careful grooming should be carried out by an experienced groomer as this breed looks pretty unique and must be clipped correctly to enhance his lamb-like appearance. The fur on the bottom part of the terrier's legs should be left longer as a nod back to their vermin catching days and the ears should be shaved apart from the tips where a little tassel should be left. On the plus side though, due to his woolly type of fur, the Bedlington terrier barely sheds and so is a great hypoallergenic dog for allergy sufferers. And due to their history of enjoying a good old scrap, you might want to keep a first aid box handy too! You could find out about other Dog Breeds in the A To Z List with photos or perhaps you'd like to check out more Unusual Dog Breeds?